The stone is roughly 0.85 metres by 0.25 metres. The Raheenlusk Stone Cross, pictured above left, stood on the border between Raheenlusk and Killannaduff. It was moved to the museum in Enniscorthy sometime after 1948. One face of the 0.54 metre high cross, features a marigold motif at the centre of the crux. 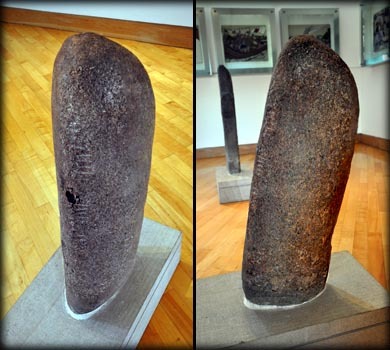 Pictured above left is a cross slab from Beggerin Island. The ruins of the church stand on the Wexford Wildfowl Reserve. 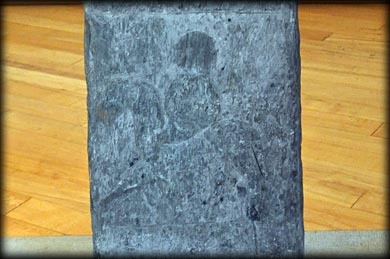 The badly weathered slab has a cross in relief with a triangular base on one side, far right. The other side features a Maltese cross at the centre of the head, with two figurative panels below. The lowest panel has a single horseman. Harbison suggests a 9th century date for this slab. Situated: On the grounds of Ferns Castle. The castle is situated at the top of the hill in Ferns just off the N11 and is well sign-posted. Discovery Map 69: T 0164 4985. Last visit Aug 2017.